Well, it is a sunny Sunday in May so for me it can mean only one thing - the return of the boot sale! We popped out this morning to our local boot sale and unsurprisingly given the weather and the imminent bank holiday it was packed. There was not much of immediate value but I was able to acquire a copy of the title you see above for a mere 50p. The Spansih Civil War is a period I would be keen to dabble in in some fashion and for a variety reasons have never really gotten very far with doing so. I acquired a large selection of 1/200th scale figures produced by a firm called Wild Geese a number of years ago but have never really done anything with them. They were pretty grim figures if I am honest and I disposed of them some time ago. Of course there is now a large variety of kit available in a variety of scales so drumming up forces would not be difficult although my own thoughts for the period lie is slightly different direction - and will form another post in due course. 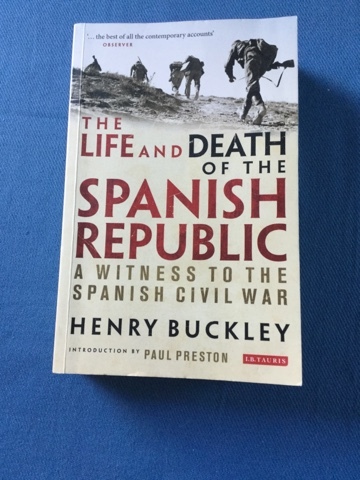 Henry Buckley was the Daily Telegraph's correspondent in Spainduring the Spainsh Civil War. He arrived in Spain in 1929, six years before the outbreak of the conflict, and left Spain with the remnants of the Republican forces that fled over the Pyrenees following their defeat by Franco in 1939. Buckley was well acquainted with the main protagonists of the conflict - Juan Negrin, 'La Pasionaria' Dolores Ibarruri, Valentin Gonzalez and Enrique Lister as well as being a good friend of Ernest Hemingway and Robert Capa. I am really looking forward to reading this and I am confident it will give me a chance to tackle a small idea I have been mulling over - again, more of this in a later post. Another good find at the boot sales, I'm jealous. I have been dabbling a bit with the SCW myself and it is a fascinating if terrible period. Best of luck to you, and I hope to see more in the future. I've sent you a PDF that you might find useful.